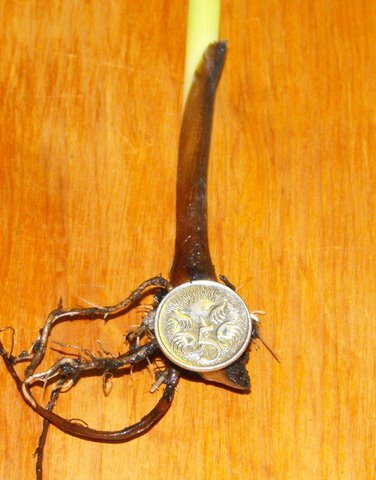 This tiny smallest canna rhizome is by far the littlest piece I have ever received in all my years of buying plants, I bought my first lot of cannas back in 1996 and since then I as the buyer have bent sent some appalling pieces. I thought I would share with you what I have received. This is probably the smallest one I simply could not believe the size of it when I unopened the package, the plant had leaf on top but it had no rhizome, it was so tiny that the shoots base fitted nicely on a five cent Australian coin which measures approx 19 millimeters or almost 2 centimeters in diameter. 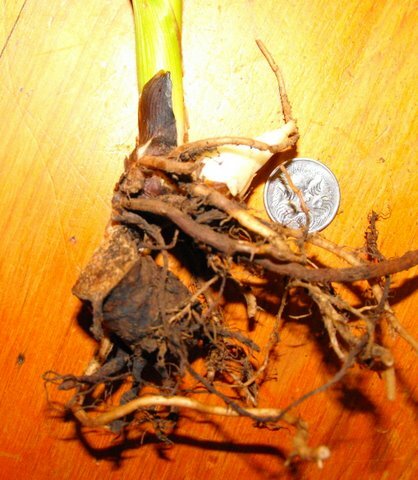 sure some plants naturally increase and clump small and tight but receiving something so small was simply ridiculous and not fair to me the buyer, the seller should have at least sent it with some rhizome attached, this is merely just a new shoot and nothing more. 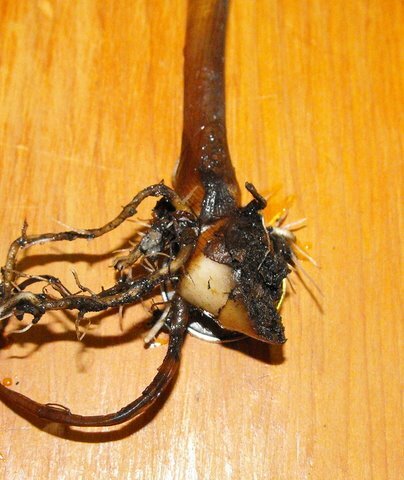 By having rhizome attached it allows the new developing shoot to feed from the attached rhizome and allows the plant to resettle and get off to a good start, myself as a seller there is no way I would ever supply such a poor quality canna to my buyers, yet it is what I and probably many others have received, take my advice and let the sellers know what is needed for the plants to settle and grow well and if they don’t or won’t replace such poor rubbish specimens then take your business elsewhere. More pictures of other cannas I've unknowingly bought that have been very very small in size upon receiving, through my eyes none are even close to being acceptable in size, please use the pictures below as a guide to what is not acceptable and I hope it helps you to know what not to buy. 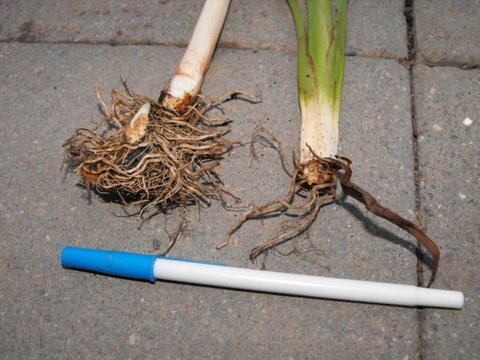 Two more, good root system on the left and the poor smallest canna on the right has been snapped right off from the rhizome. Three more small cannas all from the one same seller, picture above. The matchbox measures just over 5 centimeters in length. The smallest canna in the center was named canna Fuchsia Fantasy and I paid $35 for it years ago in approximately 2005 or2006, yes I was disappointed upon opening the package and even more disappointed when it eventually flowered, as it was being sold as a aquatic canna I planted it alongside the other aquatics I have and when it eventually found its feet and finally flowered I was even more disappointed as it appeared identical in its height, flower size and colour to the aquatic canna Erebus. I kept it on trial for a couple of years giving it the best chance possible to be true to its name, I soon realized I received either the wrong plant or canna Erebus has been renamed as canna Fuchsia Fantasy. Too this day it’s still labeled as I bought it and still growing in the same spot next to the other aquatics and nothing has changed or developed differently, it doesn’t flower a fuchsia pink or orange red tone as it was described, it is clearly only canna Erebus. The canna on the right was named and labeled as canna Ra, but ended up being canna Burbank, yes more disappointment as this was the third Ra canna I had bought from different sellers once again it was not the correct one. In my quest to find the true correct cultivar called Ra I got lucky the fourth time, I hit the jackpot and I got the real thing, I realized just how muddled canna names are and confused some sellers must be. 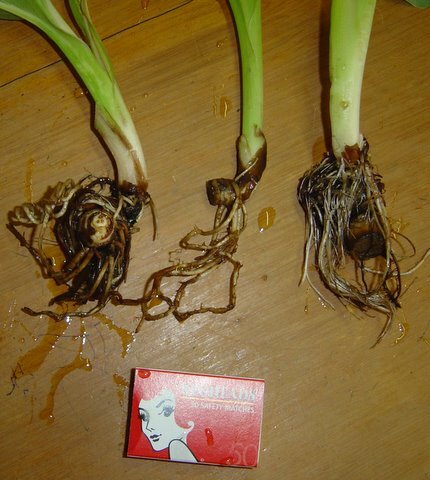 This is a bagged canna from a leading retail Hardware store for $9.95, it has been packaged in dry wood shaving and its sizing is better when compared to the others pictured above as the new shoots are still attatched to a small amount of old rhizome which they draw energy from to grow, still a smallest canna and sad messy specimen to buy. The two plants on the outside are my plants strait from the ground, washed and ready for packing and dispatch. A bit better, the older rhizome has been partially snapped from the new shoot, at least this one has some eager looking new eye growth. 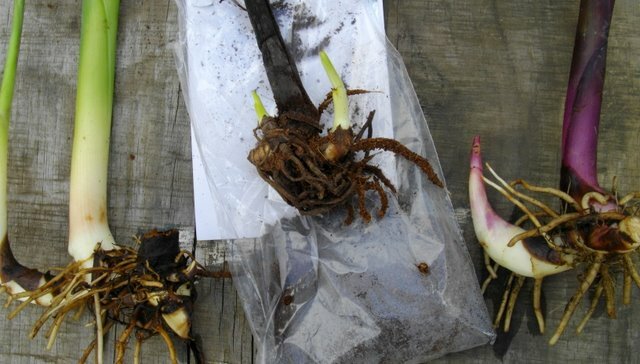 If you get the chance to pick through canna rhizomes when buying them, ensure they have a couple of good new growth and definitely select the ones that have been grown well with adequate developed rhizome.